Jo and myself loves kimchi and anything with kimchi :) Wakame in kimchi sauce serve as great appetizers and hot spicy seafood kimchi soup serve as great starters and kimchi jigae and kimchi bokumbap are great comfort food and what I am going to share here is the most common home food of the koreans... Kimchi Bokumbap ! 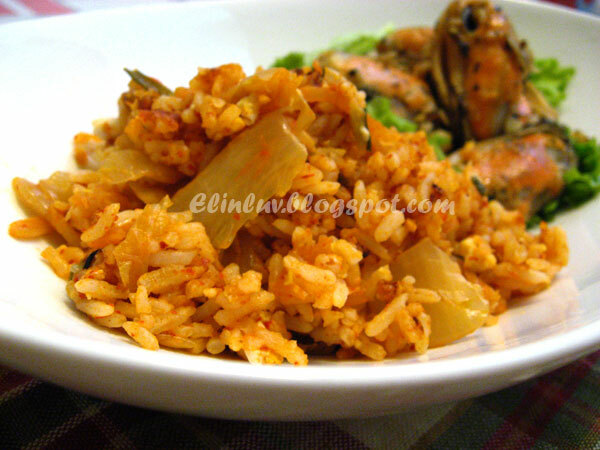 Overnight cooked rice would be ideal for making Kimchi Bokumbap. 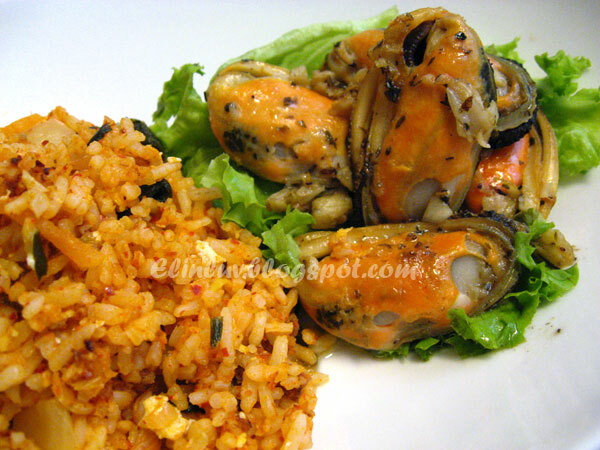 You can add in beef and seafood but for this time, I make some sauteed NZ Mussels with garlic and mixed herbs as a side for this kimchi fried rice ... a-ju ma-sseo-sseo yo !!! Heat olive oil in a wok, saute garlic , shallots till fragrant, add in kimchi, chilli oil and chilli paste , add in the cooked rice and stir fry till the ingredients are well combined, put the rice aside, pour in the beaten eggs and continue to stir till the eggs become streaky , push down the rice and stir fry till the rice and eggs are well. Add salt and pepper to taste and add in spring onions last. Dish up and served hot with the sauteed mussels as a side dish. Heat up the olive oil in a non stick pan under medium high heat , add in the garlic and saute till fragrant, add in the mussels and stir fry for 2 minutes on each side , add in the mixed herbs and salt and pepper to taste and continue to cook the mussels for another 1 minute. 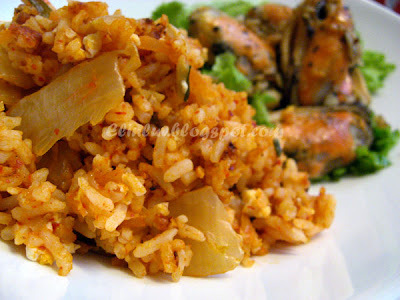 Dish up and serve as a side dish for the kimchi fried rice. ma sseo sseo yo, elin! do you also get the korean chilli paste from jusco? I really like Korean food - so glad to have come across your blog! ooo kimchi bokumbap is so delicious! It makes such great comfort food. Love your post. 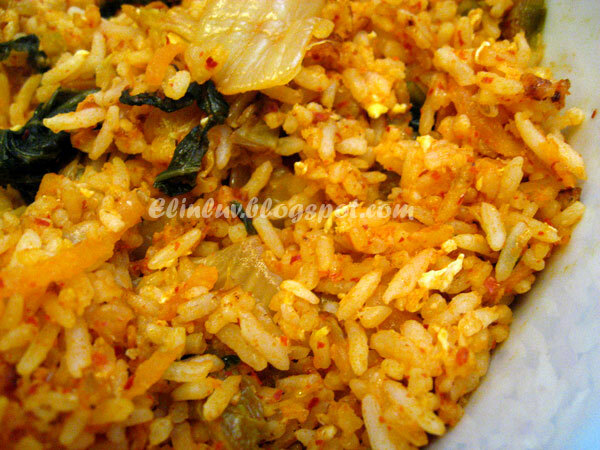 I LOVE kimchi fried rice! Try it with a topped egg, so delicious. Yup, still drooling. OK, you've confirmed that I need to go get some spicy something for dinner tonight. yummmy. I'm so hungry right now; after looking at your blog I'm even hungrier. This is great! 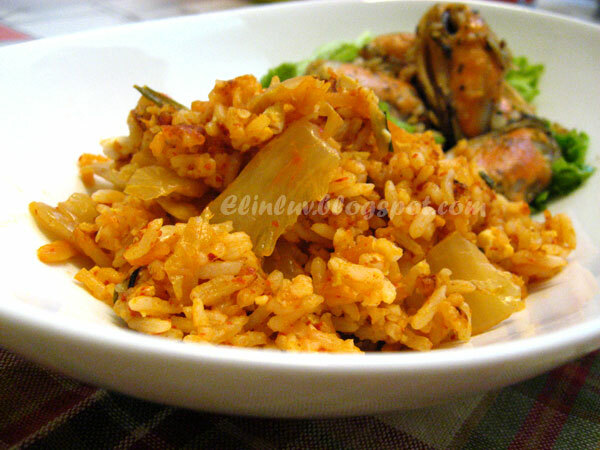 I luv kimchi. I usually fry it with beef. Also luv the Bibimbap rice. This would be just as delicious! Happy New Year. haha, I agree with Anncoo, me too want to live next to you. This Kimchi fried rice makes me hungry and now I got to go search for something for supper. Hi Anncoo, lena, Kate, Cindy , Roxan, Belinda , Arthur , Dinewithleny, Esther, Ping, And Veronica :)) Happy New Year to you all too !